The club confirmed in a statement on its official website that painter Şahin Aydın had died at the site. It expressed condolences to Aydın’s family and said a full investigation into the incident was under way. Beşiktaş is in the process of finalizing the construction on the same site of its now-demolished historic İnönü Stadium by the Bosphorus. 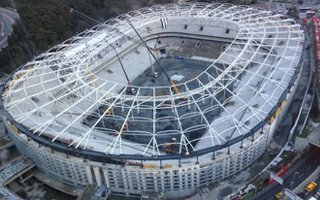 Throughout the construction process the team has been playing its home matches in several other stadiums across Istanbul. In July last year two other workers were injured when the steel roof of the under-construction stadium collapsed.